Bioaura 2019 the intercollegiate biofest conducted by the Department of Life Sciences was organised on 18th February 2019. The participants for the fest were UG students across various colleges of Bangalore. The fest had plethora of events like Advertising, Lecture Contest, Jam, Painting, Quiz, Event-X, Crime Scene Investigation, Pot Pourri and Biomanager that was named after eminent scientists contributed to the field of Life Sciences. The inaugural ceremony of the fest was headed by Fr. Josekutty P.D, Principal, Kristu Jayanti College and the chief guest was Mr. Ashish Srivastava, Vice–President HR – Inbisco India, Part of Mayora group. In his presidential address, father enlightened about integration of innovation and creativity for contribution to research. Mr. Ashish Srivastava, in his address rationalised the role of teachers’ in every student’ life. Adding to the fact he conveyed that knowledge can be mined from data available through internet, but for one’s wisdom, students have to indeed look upon teachers for a world of success. A marketing event, advertisement had the students to sell their product in an innovative way. Lecture Contest a pep talk had the participants’ speak on any topic with the use of power point presentations. Just a minute (JAM) with 20 different topics was given to assess the vocabulary skills and knowledge in different areas. To exhibit their creativity and concern for the environment, painting competition with the theme DREAM GREEN was held. For demonstrating their practical skills, hands on experiments were given with time limitation in Event X. Crime scene investigation event tested the investigation skills of students in judging the culprit. Potpourri event was conducted to know the thought process, presence of mind and the ability to work in team. Leadership skills enough to thrive in the competitive world were judged in the event biomanager. In the valedictory ceremony, Rev. Fr. Augustine George, Vice Principal, KJC felicitated the winners of various events and appreciated the participants for their efforts. 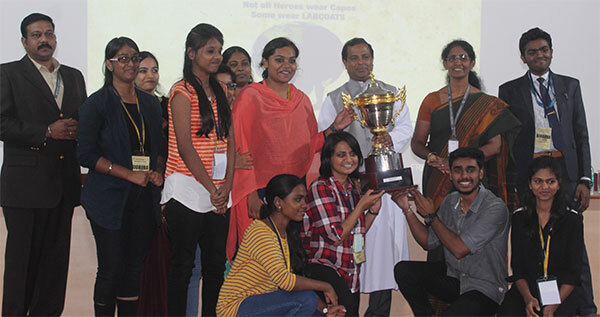 The overall champion was bagged by Reva University and the runners up place by Garden City College. Staff coordinators relentless support and guidance along with the all the faculty members and tireless zeal of student coordinators and event heads made the fest resounding one. The Life Sciences Department of Kristu Jayanti College organised Connoisseur 2018, an intra collegiate biofest for undergraduates and Bioventura 2018 for post graduates on 16th August 2018. The fest was inaugurated by the guests of honour were Mr. Nihar Gundumala, Head of Employer Brand Marketing and Ms. Shwetha Sharma Associate Director, Recruitment and Talent Advisors both from Covance in the Mini Auditorium II. Dr.Challaraj Emmanuel, Staff Co-ordinator of Life Sciences Club, welcomed the gathering. Fr. Lijo P.Thomas, Financial Administrator and Head, Department of Computer Science, Kristu Jayanti College, presided over the function. In his presidential address, he enlightened about integration of clinical trials and data management in the area of research. The Chief guest, Mr. Nihar expressed that research is utmost important for the betterment of the health and in turn society. Ms. Shwetha Sharma stated that development in life sciences brands, today’s healthcare challenges into tomorrow’s solutions. She explained the varied roles of Covance in offering laboratory testing services to the chemical, agrochemical and food industries and as a top global provider of Phase III clinical trial management services. Discussion on the recruiting process to the students was indeed valuable. This year, Connoisseur 2018 was set up with the theme ‘Harry Porter’ and the groups were named after this theme viz., Muggle Mayhem, Animagous Army, Granger Zone, Buckbeak Banter etc. For Connoisseur 2018, along with the events such as short documentary movie making, quiz, crime scene investigation, pep talk, debate, photography, poster making, tableau, biojournalism, biomarketing, biomanager etc., two new inclusions were made - the Yule ball (fashion show) and the Muggle movies(advertising). Events such as biomanager, debate, quiz, witnessed preliminary rounds and final round.. The participants of the fest were first year M.Sc. students and 1st and 2nd year B.Sc. students. Off stage events and preliminary rounds of few events started on 6th August 2018. In Bioventura 2018 the Intra Collegiate biofest for PG students, the participants were divided into groups and were named with genetically modified entities like tegon, humulin, synthia, etc. Events in Bioventura 2018 were Transcript, Reflex- a quiz event, Polemic - the debate competition. Biomarketing event had the students to sell their product in an innovative way. In Biojournalism event, participants reported on a current scientific issue in their own creative means. Cinethesis had factual documentary presentation on scientific importance. Corrections to be made in the intentionally inserted wrongs’ in the research papers made up the event Blue Pencil. Nutrichoice, cooking without fire, utilization of used waste items for a constructive purpose helped in crafting Wealth out of Waste. Crime scene investigation event tested the investigation skills of students in judging the culprit. In the valedictory ceremony, Rev. Fr. Augustine George, Vice Principal, felicitated the winners of various events and appreciated the seniors for having conducted the biofest successfully. The overall champion of Bioventura 2018 was bagged by the group Herman and under Connoisseur 2018, Animagous Army won the championship. Staff coordinators relentless support and guidance along with the all the faculty members and tireless zeal of student coordinators and event heads made the fest resounding one. The fest helped the students to showcase and hone their creativity and expertise in the field of life sciences. On the flip side, the fest also helped in team building among the students and enhanced their event management and leadership skills. Connoisseur and Bio Ventura are Intra collegiate fests organized by the final year Students of BSc and MSc Programme for the juniors. It is an opportunity for the students to rekindle academic concepts, showcase their skills and to work together as a team as they participated in various events. This Bio-fest excavated the heights of creativeness, innovativeness and enriched knowledge on this platform. The fest was inaugurated on 18 Aug, 2017 by Ms. Smitha Murthy, Founder Director, Credora Life Sciences, Bangalore. In her inaugural address Ms. Murthy emphasize the importance of Passion in the field of Lifesciences. The Presidential address was delivered by Rev Fr. Josekutty PD, Principal of the college highlighted about the importance given to research and entrepreneurship in the field of life science. This year the fest had a total of 16 events for UG Programme namely Gold Rush (Treasure Hunt), Insta Nutra ( Cooking without Fire), Jeffery’s Lab (Crime Scene Investigation), Picaso Art (Poster Making), Kalam Jr. (Young Scinetist), Event X, Chimera (Pot Pourri), Tableau, Reflex (Quiz), Turncoat, Pep Talk (Lecture Contest), Eagle’s Eye (Documentary), Imprint (Photography), Minute to Win it, Polemic (Debate), Reporting and Bio Shuttle; out of which 2 events Chimera and Event X were introduced for the first time. Events for PG students such as X-files, Nutrichoice and Transcript, Reflex, Biojournalism, Biomanager, Polemic, Cinethesis, Biomarketing and Blue pencil were also conducted. The fest was hosted for the first and second year students with a total strength of 120 participants. The students were assigned into 10 teams. The team names allotted was Helium, Neon, Argon, Krypton, Xenon, Strontium, Titanium, Radon, Scandium, and Chromium; named after the elements of the periodic table. The fest spanned a total of 8 days and comprised of a total of 16 events, out of which, 6 new events were introduced this year. The Department of Life Sciences, Kristu Jayanti College organized “ Bio Aura”, an inter- collegiate Bio Fest on 14 March and it’s a maiden venture. Bio Aura is a unique platform for undergraduate and post graduate students to radiate their attitudinal, interpersonal and communicative skills. This Bio Fest was attended by 130 students from eight different colleges. The various events of the fest included (Reels of life) Documentary presentations, Science Triathlon, Quiz, Working model presentations, Lecture contest and Entrepreneur in You. Bio Ventura is the intra collegiate bio fest for postgraduate students. This is the 2nd year of Bio Ventura in which new events were introduced and there was a lot of excitement among the students about the events. The fest started with the very 1st event “Decoding the Sequence” on 13 August 2014 at 11 AM in which 7 teams participated among which 4 teams proceeded for the finals. Followed by “Spin a Yarn” at 12, which was an individual event where the startup of the story was shown & the remaining story was to be narrated in a creative manner by the students. The next event was “Quiz” prelims with 30 objective questions. The next event was the “Bio Art” in which 10 teams (2 per team) were participated. In the event, biological products were used to create & depict biological processes in the form of art. The next event was “Scientific Writing” where 10 students participated. It was an individual event where in they were given a research article, the concept was to be grasped & review of the article should be rephrased in their own words. On the next day, 14 August the Bio fest Bio Ventura was inaugurated by Dr. Arun Chandrasekhar, President, of Bhatt Biotech. He delivered the key note address. Fr. Augustine George, Vice Principle of the college delivered the presidential address. The first event for the day was Documentary in which 3 teams participated, with an open topic related to life science. Followed by was the final round of decoding the Sequence in which 4 teams took part. The next event was the “Trigger the Taste buds” in which dishes were prepared without fire but with the products of microorganisms. Various products were used to prepare variety of dishes wherein we saw the creativity of the students. Connoisseur, the annual intra collegiate Bio-fest is conducted by the department of Life Sciences. Like every year this year also Connoisseur was a testimony for every life science student’s talent. The main event was scheduled from the 23 of July to the 10 of august 2012. Connoisseur was headed under the able guidance of our HOD Dr.Elcey CD, staff coordinators Mrs Sangeetha and Mr.Thomas Abraham and all the faculty members of the department of Life Sciences. The first and second year students of BSc Biotechnology and Microbiology were divided into 6 groups under the titles, PHOENIX DACTYLIFERA, NELUMBIUM, CANNABIS, DATURA METAL, DIGITALIS and ATROPA BELLADONA. There were 14 events of which 2 events were newly introduced that year, Bio photography and Mind mapping.